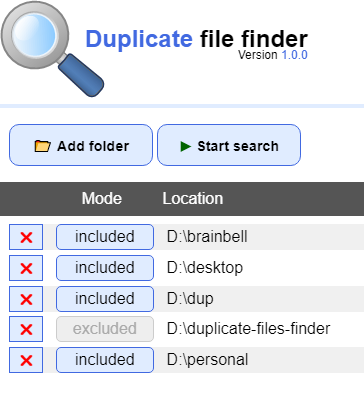 We’ll create user interface (UI) for our “Duplicate File Finder” desktop app with HTML and style it witch css. It is a very simple interface, just a log on top with Application name, version number and two button Add folder and Start search for controlling the app behavior. The “Add folder” button will browse the file system and “Start search” will trigger the app to initiate the scanning of added folder recursively. This app let you to add multiple folders in the list for scanning. included mode: Will scan the folder and its sub-folders (recursively). It is the default mode when you add a folder. Location: The complete path of folder. openDirectory: Allow directories to be selected. multiSelection: Allow multiple paths to be selected. callback Function (dirPaths): An array of paths chosen by the user. Now create a css file style.css inside the Duplicate Files Finder project folder and add the following code. We edited the main.js file and removed the default menu bar by calling the setMenu(null) method. We discussed how we can get the full path of a file or folder by using the Electron’s dialog api. At the end, we re-created the index.html and beautify it with css using style.css. The next page will cover: how to interact with users and respond to their actions by creating the renderer.js file.